ON Thursday last, near the Olympic Park in Rio, a mugger on a motorbike tapped on the window of a BMW X6 and demanded that the occupant of the car hand over his wristwatch. The BMW driver, rumoured to be a Russian diplomat, had another idea. He grabbed the would-be thief, hauled him in through the window of the car and shot the man dead at point-blank range with the thief’s own gun. The body of the hapless mugger lay sprawled on the road for several hours as police investigated the incident, and was witnessed by wide-eyed Olympians. The message to would-be thieves was crystal clear – think long and hard before you tap on the window of a Russian diplomat’s car. It occurred to Hurler as throw-in approached in Dublin on Saturday that the diplomat’s no-nonsense approach to self-defence was as good an analogy as any for what Donegal would require against the Dubs if they were to stand any chance of delivering the shock of the 2016 All-Ireland series. Fifteen seconds after said throw-in, Hurler’s shaky optimism that Donegal would lay down an emphatic marker on the first Dub who tapped on their window was cruelly disabused when Diarmuid Connolly raced, unmolested, through on goal. The fastest All-Ireland quarterfinal green flag of all time was only denied by a superb save by Mark Anthony McGinley. If that audacious Dublin strike – straight down the central artery of Donegal’s once fabled defence – was a portent of things to come, then we were in for a long, painful evening. Truth be told, we were outplayed from throw-in to final whistle. That we didn’t capitulate at the feet of the All-Ireland champions – as so many teams have – says something about the still beating heart of this once great Donegal team. There’s no substitute in sport for guts. Sometimes when acumen and sharpness abandons the sportsman or team, all that is left is guts, pride and dignity. And on a day when Dublin held all the aces, that’s what Donegal brought to proceedings in spades. It was a day that truly marked the end of an era. Like the wounded Cuchulainn, tied to a pillar so that he could face his enemies, Donegal have been a team with fading warriors among their ranks for a year now, maybe more. The news in the aftermath of Saturday’s defeat that the great Colm Anthony McFadden has called time on a glittering career was inevitable. More will follow. Rory Kavanagh, Karl Lacey and Christy Toye will likely think long and hard about subjecting their bodies to yet more punishment. And there may well be others – Hurler will be surprised if Rory Gallagher himself remains at the helm. 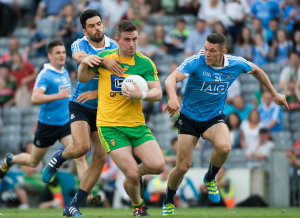 Hurler counted half a dozen unforced Donegal errors in the first nine or ten minutes, unforced errors that fanned the flames of Dublin’s confidence. When Connolly trailed his second clear goal chance just wide of McGinley’s left post after 15 minutes, there was a sense that Donegal were sitting on a time bomb. And yet, for all Dublin’s undoubted dominance, Michael Murphy’s converted ’45 after 19 minutes left matters level at 0-2 apiece. It took another dead ball conversion from Murphy eight minutes later, this one from 50 metres or more, to stop the Dubs creeping into an unassailable lead. Unlike Donegal, Dublin were experiencing joy from low percentage long ranges shots from Diarmuid Connolly and Paddy Andrews. It had shades of 2014 – but only for the foolishly optimistic among the Donegal faithful.